Auburn, Ala (EETV)- Coach Bruce Pearl and the Auburn Tigers basketball team welcomed in a tough SEC opponent to Auburn Arena Saturday night when the No.12 Kentucky Wildcats came looking for their fourth win in conference play and fourteenth overall while No. 14 Auburn was looking to carry momentum from their last game over after defeating the Georgia Bulldogs 93-78. Students waited in the rain for hours to get a look at this matchup which lived up to the expectations. The Tigers came out firing and managed to keep the game close until the end of the first half when Kentucky closed on an 8-0 run thanks to two scores from Keldon Johnson and a three pointer by Tyler Herro to put themselves up by eight at the break. Bryce Brown had a quiet first half only scoring three points going 1-2 from the field. But in the second half a different player seemed to emerge. Brown had twenty five points in the second half while his backcourt partner Jared Harper finished with 17 points for the game. The Tigers were shaky early in the second half as Kentucky rode the hot hands of Johnson and Herro but Brown would not let them be comfortable at any time. At one point scoring or assisting on thirteen straight points for Auburn. Down two with just over thirty seconds left, Harper pulled up for three and found the bottom of the basket to put Auburn up by one. The next play Harper fouled Herro and sent him to the line with a chance to tie and take the lead which he was able to do. Primed in position to hit another big shot, Harper had the ball right where he wanted it with the game on the line, in his hands. Harper drove and put up a layup that would have given Auburn the lead but it just rolled out. When asked about the shot Harper said, “I knew when I was able to get by him that I had the angle, I feel like when I shot it I put it in the right place on the backboard. It just didn’t go in.” After a made free throw and a missed last second heave from Samir Doughty at half court. The final buzzer sounded and the Tigers would fall by a final 82-80. Brown would finish with 28 points going 8-9 from the field, 6-7 from three point range and 6-6 from the free throw line. Pearl said of Brown "“Bryce Brown was phenomenal in every timeout, he was the one in the timeouts who was keeping the guys positive, focused.” The loss drops the Tigers t0 13-4 overall and 2-2 in SEC play. The next game will be at South Carolina on Tuesday with tip-off slated for 5:30 p.m. CT on the SEC Network. 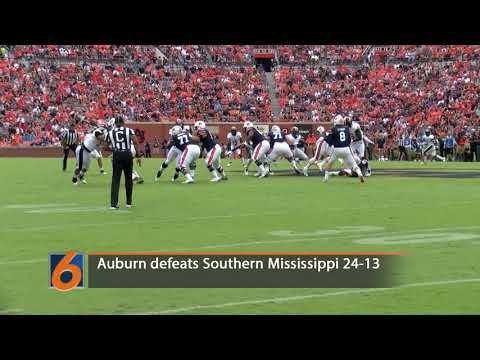 Auburn, Ala (EETV) - Amid a two hour rain delay, the Auburn tiger defeat Southern Mississippi 24-13. 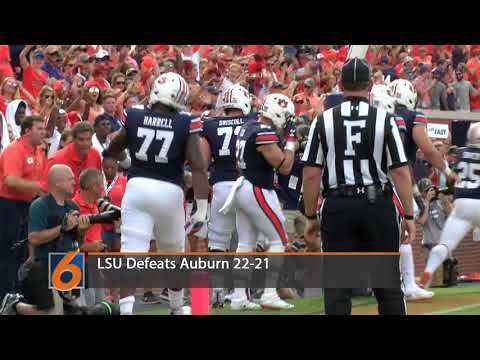 Auburn, Ala (EETV)- Despite two strong wins against Washington and Alabama State, LSU defeats Auburn in their SEC home opener 22-21.